Cooked carrots always get such a bad rap, especially when it comes to family dinners. I can't count the number of times I've thought about a less-than-stellar family meal that somehow involved soggy orange discs formerly recognizable as carrots. Just, no. To avoid the horrible fate of having our dinner parties reduced to post-digestion dissection by serving up only sensational side dishes. That's right, sensational. No mediocrity this holiday season, go for the gold (or orange) and dazzle your family and friends with a decidedly delicious dish! Oh and pssst! This recipe is gluten free, milk/dairy free, soy and corn free, eggless and vegan. Wowza! Peel your carrots, chop off the ends and cut into 1/4-inch sticks (batons if you're a student of Julia Child) or chunks or rounds or whatever, just realize that your cooking time may vary depending on thickness. 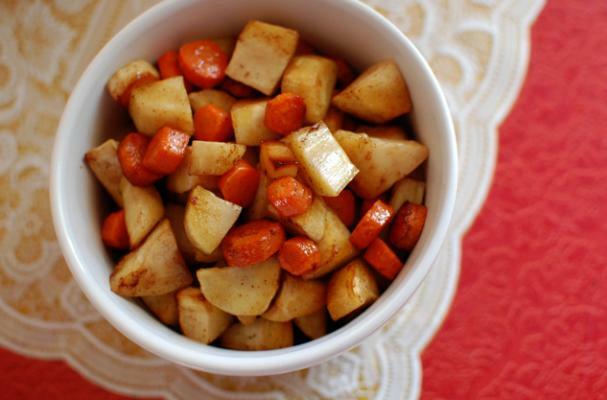 Toss carrots, EVOO, cider syrup and nutmeg in large bowl, stirring until well-coated. Arrange carrots in a single layer in a glass/ceramic baking dish (or parchment lined roasting pan). Throw Gently place 2 sprigs of rosemary on top, put the whole thing in the oven and bake for 20 minutes. Meanwhile, take your third sprig of rosemary, strip the leaves from the woody stem and mince (the leaves) -- we're aiming for 1 1/2 tsp chopped rosemary. Remove the carrots from the oven, discard the initial 2 rosemary sprigs and sprinkle the freshly chopped rosemary over the carrots. Stir well, making sure to turn the carrots over. Return carrots to the oven and continue roasting for an additional 10-15 minutes or until just beginning to brown, tender but still firm. Season with salt and pepper, then serve, garnished with a sprig of fresh rosemary. Variations: add in diced parsnips (seen above), fresh Granny Smith apples, a dash of chili powder (or chipotle powder... mmm) or cayenne pepper and/or a sprinkle of allspice or coriander. This does sound sensational! Definitely not boring and soggy. I think a dash of chili powder powder would be the perfect complement.